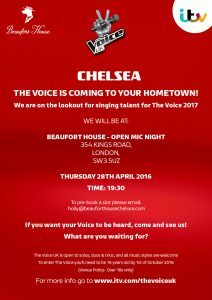 We are excited to announce that we have a full line-up of incredible talent confirmed for our Open Mic night in association with The Voice UK this Thursday 28th April 2016 from 7.00pm till late. With 14 singers to enjoy throughout the evening, and a variety of musical talent, this promises to be a night to remember.There will be the casting producers from the ITV hit show The Voice in attendance, so whether you are an aspiring singer, coming to support the acts, or just want to enjoy an evening of live music come along to Beaufort House for a night of music filled fun! There will be a complimentary drinks reception from 7.00pm – 7.30pm so arrive early to enjoy our delicious house cocktails, some of the best in London. Our food & drink menu will be available throughout the evening.